The other variation of that scenario is the classic (exaggerated, of course) instance when a coach would be looking down on an injured player and saying something like, “Okay, rub a little dirt on it and let’s go.” Then helping the player up. But times have changed. With the advances in medicine and health care in a broad array of fields, a little more expertise is called for. And more and more, public schools are following the lead of colleges and professional athletics by making sure there’s an athletic trainer available. “Now, we actually have a professional, someone who’s trained to address the medical problems we face every day in athletics and it’s very important to our program,” he stated. That professional is Christa Finney of OrthoArkansas. 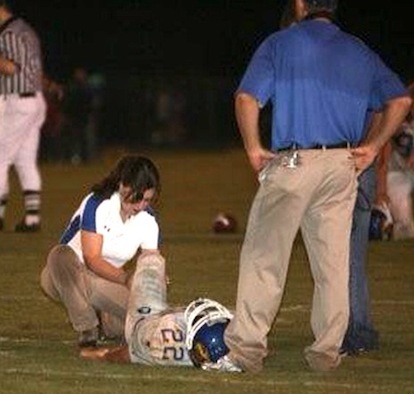 She is now in her fourth year as the athletic trainer for the Bryant School District. She’s worked 12 years including two as an intern with Ortho. She’s served as a trainer at Little Rock Catholic then helped implement programs at Little Rock Episcopal Collegiate then Arkansas Baptist. When Danny Brown, the former trainer at Bryant, decided to take a teaching position at the school, Finney was asked to move to Bryant. OrthoArkansas also supplies trainers to Benton, Central Arkansas Christian and Jacksonville. Originally from Little Rock, Finney did her undergrad work at Ouachita Baptist University. She did her grad work at the University of Central Arkansas. She was originally in Speech Pathology but decided to go back to school. This month has been designated National Athletic Trainers month by the National Athletic Trainers Association, the national governing board for registered athletic trainers. “It’s just to kind of recognize what we do as a profession and trying to get the word out about what we do and how we can be of service to the community and the schools,” Finney related. Along with being an active member of the National Athletic Trainers Association, Finney is a member of the Southwest Athletic Trainers' Association, the Arkansas Athletic Trainers' Assocation as Executive Board Recording Secretary, on the Public Relations Committee, and on the High School All-Star Committee. She’s also an American Heart Association Basic Life Saver Certified Instructor. To this point, it’s still not the norm at most Arkansas schools to have a trainer. “That’s another reason for why they started National Athletic Trainer month the last three or four years,” Finney noted. “We actually have a legislative task force that I’ve actually been a part of it. We’re trying to get Arkansas legislation to where every secondary school is going to be required to hire an athletic trainer, whether that’s in a role of teacher-slash-athletic trainer or hiring outright an athletic trainer or even like having an athletic trainer paid half by the school and maybe half by a clinic or what have you. However, they work it out whether it’s outreach like we do at OrthoArkansas or half-and-half. “It takes a tremendous amount of pressure off the coaches,” she continued. “They’re busy coaching. They don’t have the time to come in (to the training room) and pretend like they know what’s going on with somebody or have to take time out to tape them or take time out to see if they need to go see a doctor. I’m able to assess that on the sideline, whether they can go back in or not. If we’ve got injuries, they come in (to the training room) and I can take care of them and get them back out there. That’s one less burden off the coaches. “It’s just a matter of communicating with them, communicating with parents and communicating with the administrators,” she concluded. The NATA website describes an athletic trainer as “an expert at recognizing, treating and preventing musculoskeletal injuries. AT’s meet qualifications set by the Board of Certification, Inc., and adhere to the requirements of a state licensing board. ATs practice under the direction of a physician and are members of a health care profession recognized by the American Medical Association. “Requirements: Must obtain, at minimum, a bachelor’s degree in athletic training; must pass a comprehensive exam to earn the ATC credential; must keep their knowledge and skills current by participating in continuing education; must adhere to standards of professional practice set by one national certifying agency and to a national code of ethics. “Daily duties: Provide physical medicine and rehabilitation services; prevent, diagnose, treat and rehabilitate injuries (acute and chronic); coordinate care with physicians and other health care professionals; work in schools, colleges, professional sports, clinics, hospitals, corporations, industry, military, performing arts. I know she has spent plenty of time with Ashley.lol.